There was little Josh Beckett couldn't do in last year's postseason. He won game after game after game, dominating in every start, on the way to a World Series title. He was supposed to do it again. But now, in the wake of a right oblique injury, suffered Friday during a side session, doubt has been cast onto Beckett's ability to lead the Red Sox to their third championship in five years. Beckett, widely expected to be named the Game 1 starter today, instead was pushed back to Game 3 against the Angels. 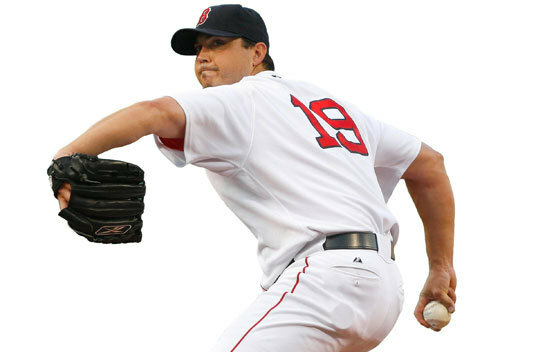 That means he will start Sunday in Fenway Park, following Game 1 starter Jon Lester and Game 2 starter Daisuke Matsuzaka. "It was on his 40th pitch," manager Terry Francona said of the injury, which was first reported by the Boston Herald. "Because it was raining and things like that, he was almost done. I don't think it actually was something where he just threw it and grabbed it. It was almost in-between pitches, where he took a deep breath and was like, 'Man, I feel something.' He went and got treatment. They've been working on him. "Initially, when you hear something like that, you're kind of like, '[Wow].' Dr. [Thomas] Gill came in and goes, 'Hey, relax. This is going to be all right.' So that was kind of reassuring." While oblique injuries are often tricky, like the one Mike Lowell suffered Aug. 13, which kept him out until Sept. 5, the team believes Beckett should be well enough to pitch in Game 3. If the Sox did not, Francona said, he wouldn't have been given a date to start in the postseason. "I don't think we would slot him in [if we weren't confident]," Francona said. "If it goes the wrong way, we're going to use hopefully very good judgment. We're slotting him in there because we think he can pitch there. Friday was actually discussed. I think after Theo [Epstein] and I and John Farrell talked about it more and more and more, we thought that was pushing it." Beckett, who was not in the clubhouse after the second game of yesterday's doubleheader, remains crucial to the team's playoff fortunes. He put the Sox on his back last season, nearly single-handedly pitching them to the title, going 4-0 with a 1.20 ERA, and winning the American League Championship Series MVP. He won Game 5 of the ALCS in Cleveland, bringing the Sox back from being down, 3 games to 1, in the series. Overall, Beckett has a 6-2 career postseason record, and a 1.73 ERA in 10 postseason games (nine starts), eighth best all time among pitchers who have thrown at least 40 postseason innings. But, after having a near-Cy Young season in 2007, Beckett has had a more difficult 2008. After starting the season on the disabled list, Beckett won just 12 games in his follow-up to his first 20-win season. He went 12-10 with a 4.03 ERA, his fewest wins in a season since nine in 2004 with the Marlins. He also had a second stint on the disabled list in late August, not pitching between Aug. 17 and Sept. 5, because of right elbow inflammation that led to a trip to Dr. James Andrews. "That's where we live and die," left fielder Jason Bay said of the team's starting staff. "He's a big part of that, but just being pushed back isn't the end of the world. Hopefully we get in a position, we get to Josh, that it's not life or death. We can re-evaluate then. He's a big-game guy, and obviously he's a guy you want out there when the game's on the line." Lester, in many respects, has been the team's ace this season, with a 16-6 record and a 3.21 ERA, throwing 210 1/3 innings. Matsuzaka went 18-3 with a 2.90 ERA, losing the first game of yesterday's doubleheader, 6-2. The Sox won the second game on a walk-off hit by Jonathan Van Every, 4-3, in 10 innings. While the rest of the postseason roster has not been released, Francona said before the first game that the team intended to carry 10 pitchers for the first round, but that the Sox might not be able to do so at this point. Other injury issues remain as barriers to naming a full ALDS roster, especially Lowell's right hip and J.D. Drew's back. The Sox could need some protection for Beckett on their ALDS roster, given the state of his oblique. Teams are allowed to make in-series substitutions (pitcher for pitcher), but if the Sox needed to do so with Beckett, he would not be eligible for the remainder of the series or for the following series. Beckett hasn't pitched since he lost to the Indians Monday. He was scheduled to throw Saturday, but then wasn't going to do so to prepare for the postseason. That was why he threw the side session Friday. Matsuzaka, who was scratched Friday, was rescheduled for Saturday, a game that was postponed because of rain. Beckett is now on track to pitch a side in Anaheim, Calif., Thursday, in preparation for his start Sunday. "I don't think it's frustrating," Francona said. "Things happen and you deal with them. If you deal with them well enough, you handle it. If you don't, you go home. I don't know. Things happen. You have to deal with them and find a way to win. I think Lester and Daisuke will do just fine." Adam Kilgore of the Globe staff contributed to this report. Amalie Benjamin can be reached at abenjamin@globe.com.